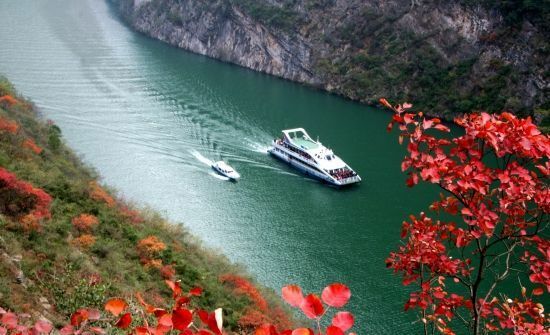 The Lesser Three Gorges in Wushan was selected as one of the forty top tourist attractions in China in 1991, jointly by the tourists and the China Tourism Commissioners votes and evaluation. The Lesser Three Gorges in Wushan refers to the three separate valleys of the Daning River, namely Dragon-Gate Gorge, Misty Gorge and Emerald Gorge. 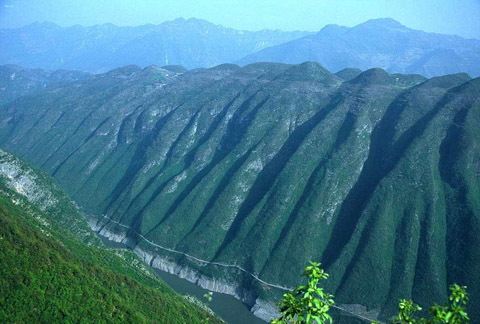 These three gorges, with an area of 160 hectares of forest, lie on the lower reaches of Daning, extending from the entrance of the Dragon-Gate Gorge in the South to Tujiaba in the North for 50 km. Here sheer cliffs and steep mountains rise on either side, creating one of natural fine arts gallery as natural scenic wonders unfold on both banks of the river. Its subtle mountains, clear waters, pretty rocks, dangerous rapids, sharp turns, fantastic caves, and stalactites in various shapes characterize the natural landscape in the Lesser Three Gorges. Monkeys, mandarin ducks, water birds and fish can be seen in this area. In addition to the continuous natural scenery there are a number of historical places of interest along the way, such as suspending coffin, boat coffin, remains of ancient plank walkway. The area has been made one of the key nature reserves in China and is becoming known as a tourist attraction continuing to offer its charms along the golden Yangtze Gorges Travel Line. Dragon-Gate Gorge, 3 km long, is the shortest of the three, stretching from the Dragon-Gate Bridge to the Rapids of Silver Nest. It is spectacular due to the mountains on both sides that are so high that they seem to touch the sky. In the gorge, there are the remains of the longest ancient plank walkway in China and a number of scenic sights, such as the Dragon-Gate Spring, Gate Guarded by Lion, Nine Dragons Pillar, etc. Shooting the Rapids of Silver Nest, the boats fly like arrows. The Daning then meanders through terraced hillside before entering the Misty Gorge. The boat has to pass the Panda Cave, Nameless Gorge and Pipazhou. Misty Gorge, 10 km long, starts at the Tortoise Shoal and ends at the Double-Dragon Town. Stalactites in numerous shapes and various sculptured groups have formed on both banks of the river. A good imagination is all your need to enjoy the sights and perhaps discover a few of your own. The traditionally seen shapes resemble the Monkey Fishing in the Air, Horse-Returning to Mountain, Dragon In and Tiger Out, Dragon-returning Cave, Fairy Peach Peak, Fairy Throwing a Silk Ball, the Goddess of Mercy Seated on Lotus Platform, Piggy Worshipping the Goddess of Mercy, Suspending Coffin. All are remarkably lifelike, and many scenes are related to wonderful fairy tales or touching legends. Emerald Gorge extends for 20 km from the Double-Dragon Town to Tujiaba. 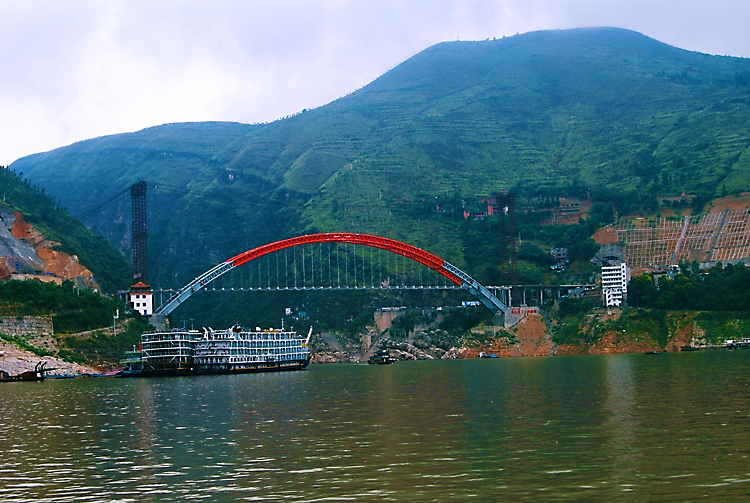 It is the longest and also gathers the beauty of the Lesser Three Gorges. On the banks, each peak seems more beautiful than the other does and the bamboo groves are luxuriantly verdant. No waterfall in not swift; no water is not green. Mandarin ducks swim in pairs in the river and monkeys leap from branch to branch. Other scenic spots include the Water Curtain Cave, Stalactitic Buddha on Cliff, the Dancing Rain from Heavenly Spring, Sheep Cliff, the Mini-Three Gorges on Madu River, Imitation Plank Paths, Steel Rope Bridge, Sky-Scraping Red Wall, Boat Coffin, Two Eagles Playing on Screen and Flying Clouds Cave. As tourism is expanding and developing rapidly in China, the Lesser Three Gorges, like a shinning pearl hidden in remote mountains, has created a great attraction to the tourists both at home and abroad. Those who have been to the place seem to return to the embrace of nature. Tourists hearty praise of the Lesser Three Gorges goes that this is the most splendid river adventure throughout China. In order to make it known to the outside world, they take photographs, write articles, compose poems and draw paintings enthusiastically one after another.